Home » TV » Happy Birthday George R.R. Martin! Written by: JediJondee46 on September 20, 2018. Happy Birthday George R.R. Martin! Martin was just at the 70th Emmy Awards when the show took Outstanding Drama Series for Game of Thrones and Best Supporting Actor for Peter Dinklage playing Tyrion Lannister. He started writing science fiction stories and the first one was published by Galaxy magazine in 1971. George wrote his first novel, Dying of the Light, in 1976. It established his “Thousand Worlds” Universe which includes Nightflyers. His novelette, Sandkings was published in Omni magazine in 1979. The story was awarded the Hugo Award from the World Science Fiction Society and the Nebula Award from the Science Fiction and Fantasy Writers of America for Best Novelette. It was adapted with episodes of The Outer Limits in 1995 and 2000. The story follows a wealthy man who collects animals and purchases four colonies of tiny, telepathic sandkings which of course become dangerous. George R.R. Martin at a Dance of Dragons signing, Barnes and Noble at the Grove, 2011, photo by the author. George published his novella, Nightflyers (1980) which covered a deep space voyage, in the Nightflyer ship, to find an alien spaceship, but the mission is complicated by the ship’s computer. It was made into a movie in 1987 and there is a new series planned for SyFy. George started writing on the first season of the 1986 Twilight Zone series. The one series I was familiar with George R.R. Martin was Wild Cards. It was an anthology shared universe with different authors. The world has New York in 1946 infected by an alien virus that transforms people into heroic Aces and mutated Jokers. It is in development for television. In 1989, George was a writer and producer of Beauty and the Beast starring Linda Hamilton and Ron Perlman as Vincent. 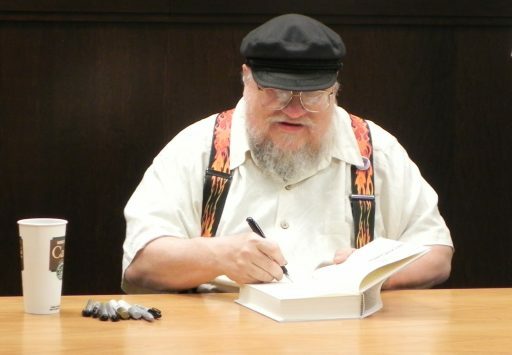 Still, George was frustrated with television and went to crafting his fantasy series, A Song of Ice and Fire, which begun with A Game of Thrones (1996). HBO began adapting the books in 2011 when George had his fifth book A Dance with Dragons. He has written a few episodes and collected Emmy and Hugo awards for the show. Happy Birthday George R.R. Martin!